Are you tired of feeling tired? It’s certainly a common complaint. Feeling fatigued can result from stress, lack of sleep, being sedentary, and/or a poor diet (which sounds like an average day for most Americans). When my clients complain of feeling fatigued, they also often tell me they find themselves using caffeine or sugary foods/beverages to keep them going. They will ask, “how bad is …” and ask about a particular product, or tell me how many sugary or caffeinated beverages/pieces of candy they are eating. Some ask about “energy enhancing supplements” also. If you have to ask “how bad” something is, maybe… just maybe… it’s not the best idea to be putting that in your body on a regular basis. Luckily, there are some lifestyle habits that can help you kick the fatigue, and feel more energized. Working these into your routine will help to “pick you up” naturally (minus the potential side effects of supplements, or the “crash” of sugar and caffeine). SLEEP: Get at Least Seven Hours of sleep each night – I’m sure you’ve heard this a thousand times or so, but there is real scientific evidence to prove it’s effectiveness! Sleep is strongly connected to our feeling of well-being. Losing just one hour of sleep can leave you feeling fatigued for days. Lack of sleep can also cause an increase in cortisol levels (stress hormones), and change hormone levels in the body (the ones that turn off the hunger signals, and turn on the fullness signals) leaving you feeling hungry even if you have had enough calories). Adding to the problem, fatigued often causes impulse decisions (ie. Ahhh, that candy bar looks really good). This combination can cause weight gain, or make weight loss more difficult. H2O to GO! Get your 8 glasses of H2O each day – Being dehydrated, even mildly, can sap energy. So drink up, if water gets boring you can add a few slices of fruit for a different flavor. MOVE IT: Get Regular Exercise – Clients always groan when I tell them this. Exercise is a natural pick up. Endorphons (the feel good chemicals) are created when we exercise. The blood gets flowing around the body, we increase oxygen use, and eventually get into better physical condition. You don’t have to be an Olympic runner… just get out and take a walk. If you haven’t been exercising, start with small goals, and work your way up. Even if it’s a struggle the first few times you do it, stick with it – and you will increase your energy levels. Eat Breakfast – This will get your metabolism going for the day, and can set you up to make healthy choices all day long. Swap out the white bagels, sugary cereal, or pastries for healthier choices like oatmeal, greek yogurt and fruit, or an egg white whole wheat wrap with veggies. Make sure to include some protein, carbohydrate and a little fat. I often tell clients to strive to get in at least three food groups at breakfast (make sure one of them is a fruit or vegetable). A common complaint “I’m not hungry in the morning” and “ I just can’t eat in the morning”. It doesn’t have to be a big meal… a piece of fruit with some peanut butter will help with energy levels, and squelch that donut craving a couple hours later. Eat Light, Eat often – Eating mini-meals throughout the day is a tried and true method for energy. It helps ward off hunger (and running to the vending machine for a snack), and helps keep blood sugar levels steady. Pack healthy snacks to take with you for the day like almonds and a piece of fruit, or whole grain cereal and a plain Greek yogurt, or make a shake with milk or yogurt, veggies, a piece of fruit and some ground flax. Make sure your portion sizes are reasonable! Eat “REAL” Food: Skip the Processed Stuff – Whole foods have antioxidants and more vitamins and minerals. Our bodies need these to be healthy and energized. Try to eat many colors from those whole foods – the deeper the color of fruits and vegetables, the higher the vitamin and mineral content. Skip the bag of pretzels, and have some blueberries and with a handful of pistachios. Antioxidants – these are present in whole foods, especially those with lots of color – so peruse that produce aisle to load up on the antioxidants. Whole Grains – ditch the processed and enriched flours. When looking for a grain product, look for the word “whole” in the first ingredient. Lean Protein: from Greek yogurt, soy products, low fat diary products, fish, and lean cuts of meat. Be Careful of Alcohol: Alcohol is a depressant, causing decreased energy. It can also cause sleep disturbances, leaving you without the sleep you need to feel rested the next day. 9. RELAX – If you cannot get the stress out of your life (and most of us cannot), then try some techniques to relax. Go for a walk to clear your head (even a short one can help, practice deep breathing, get a massage, take up yoga, etc. There are lot’s of relaxation techniques, choose one or a few that you are comfortable with, and do them regularly! 10. See your Favorite RD: Consider a visit with a Registered Dietitian to pinpoint any nutrient deficiencies in your diet that may be causing fatigue. 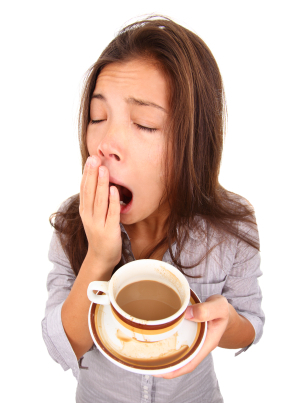 Deficiencies in certain vitamins and minerals can lead or contribute to fatigue. RD’s can also help you build a healthy meal plan, with portion sizes that are right for you. 11. See your Doctor: If you have tried lifestyle changes and continue to feel fatigued, you may have a medical condition causing the issue. Talk with your doctor about your symptoms and concerns.